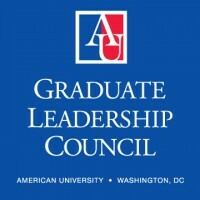 The Graduate Leadership Council (GLC) is the representative body for the more than 3,800 graduate students at American University (AU). The GLC brings together the leaders of the five graduate student councils at AU to mobilize on issues that are relevant to graduate students specifically and the AU community generally. It is the mission of the GLC to ensure that your time as a graduate student is as enjoyable as possible by providing social networking events and activities, as well as advocating for your concerns directly to President Burwell and the AU Administration. You can always get in touch with the council directly at info@auglc.org. Dances, town halls, networking events, and professional development opportunities… if the GLC or a GSC is putting on an event you can find it in the calendar below. Click on an event for details and relevant links. The default setting of this calendar is to include events for the GLC and all GSCs. You can use the drop down menu (the downward facing arrow in the top right hand corner of the calendar) to select or deselect desired GLC and GSC calendars if you so choose.